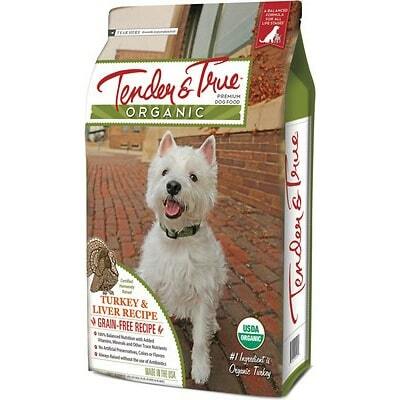 Tender & True Organic Chicken & Liver Recipe is a high-priced dog food with good quality. This product has no controversial ingredients - including zero artificial preservatives, colors or flavors. While it does have relatively high carbs, making it less nutritionally balanced, the protein and fat are mostly from high-quality sources. Also on a positive note, Tender & True has a below-average number of recalls and was overall quite transparent when answering our questions. This product has a somewhat low amount of calories. It’s important to understand how many calories you are feeding to prevent under or overfeeding. Lower calorie foods like this can be for weight loss or less active dogs who require fewer daily calories. Based on your dog's current weight and activity level you may want to feed more or less than the recommended amount. It's helpful to know that weight loss foods often have fewer than 340 calories per cup, weight maintenance foods typically range from 340-380 calories, and high-activity dog foods are usually over 400 calories. Organic Chicken, Organic Chicken Meal, Organic Tapioca Starch, Organic Dried Pea, Organic Chickpea, Organic Flaxseed Meal, Organic Potato Flour, Organic Chicken Fat (Preserved With Mixed Tocopherols), Organic Pea Flour, Organic Chicken Liver, Organic Liver Digest Meal, Menhaden Oil (Preserved With Mixed Tocopherols), Choline Chloride, Salt, Natural Mixed Tocopherols, Ascorbic Acid, Vitamin E Supplement, Zinc Proteinate, Zinc Sulfate, Manganous Oxide, Manganese Proteinate, Inositol, Ferrous Sulfate, Niacin, Vitamin B12 Supplement, Zinc Oxide, Iron Proteinate, Thiamine Mononitrate, Biotin, Riboflavin Supplement, Calcium Pantothenate, Pyridoxine Hydrochloride, Sodium Selenite, Copper sulfate, Vitamin A Supplement, Copper Proteinate, Citric Acid (Preservative), Vitamin D3 Supplement, Folic Acid, Potassium Iodide. The average dog food we reviewed has 39 total ingredients, with 1 controversial ingredient. This product has 1 controversial ingredient, see more below. Tapioca is a gluten-free starch extracted from the root of the cassava plant. Because it mostly consists of carbohydrates and is low in fiber, Omega-3 and Omega-6 fatty acids, we do not consider this a high-quality dog food ingredient. Organic dog food ingredients are free of antibiotics, synthetic hormones, pesticides, chemical fertilizers and artificial preservatives. They are also not allowed to be genetically modified. Organic peas are a good source of carbs, fiber and protein. Peas are starchy but high in vitamin A, vitamin B6, vitamin C, vitamin K, phosphorus, magnesium, copper, iron, and zinc. We consider this a healthy dog food ingredient. The U.S. Food and Drug Administration (FDA) has warned that there is a potential link between peas and canine heart disease. It is still too early to draw conclusions so we cannot yet say if peas are a generally high-quality dog food ingredient or should be avoided. Liver digest meal is produced by chemically breaking down the organ into a liquid that can be used as an added flavoring. It makes it more likely your dog will like the food. However, this is a controversial ingredient because it's a heavily processed animal ingredient that may contain lower-quality ingredients. Additionally, the species it comes from is unknown here. This food is made in the USA. That’s great because high quality and food safety standards need to be followed. This food includes these meats and added fats: Organic Chicken, Organic Chicken Meal, Organic Chicken Fat (Preserved With Mixed Tocopherols), Organic Chicken Liver, Organic Liver Digest Meal, and Menhaden Oil (Preserved With Mixed Tocopherols). Almost all of these very transparently show the animals they are made of, that’s great. However, Organic Liver Digest Meal misses the mark and doesn’t label where it comes from. 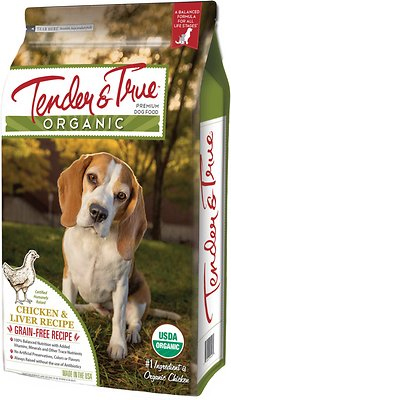 Tender & True Organic Chicken & Liver Recipe contains 0 controversial artificial preservatives. It’s important to know that ‍not all artificial preservatives are bad. That’s because they serve an important purpose, which is to prevent food from spoiling. However, we consider 11 artificial preservatives controversial because of their potential link to cancer and other serious health conditions. Tender & True has a below-average number of dog food recalls. Tender and True initially provided a quick but incomplete response. With a follow-up email, they were able to provide some very good information but did leave a few questions unanswered. Tom R. Willard, Phd: Received a BS in Animal Science (AS) in 1967 and my MS in AS and Statistics in 1972. I finished my PhD in 1974 with a major in Biochemistry with emphasis in protein and mineral metabolism from North Carolina State University. My first employment was with Campbell Soup Co. where I formulated their first dry dog food. I also developed many prototype canned dog foods. Campbell Soup never had cat foods. I was VP of Technical Services for the Iams Company for a number of years in Dayton OH in the mid ‘80’s. I have been in the pet food industry for 45 years, and am one of the 3-person panel who reviews all of the Pet Food Forum’s research papers for the 4 Forums around the world. I have spoken at the US Forum a number of times on nutrition, ingredients, formulations, animal care, and quality assurance protocol. I have consulted for manufacturers in the US, CA, the UK, Germany, the Chez Republic, Japan, China, Brazil, and Chile. We do analytical analysis on all of our foods at the plant and again check samples at several independent laboratories. We conduct our animal studies at an independent animal facility for palatability, stool quality and digestibility. We also do urine pH on our cat foods. We also do some in-home testing but not of a statistical basis. As well, we do comparative studies against some of the market leaders. All of our diets meet the 2018 AAFCO Nutritional Guidelines for both lines of dog and cat foods. All of our ingredient purchases is controlled 100% by our company, which has been in the meat industry for over 30 years. We buy only antibiotic free (ABF) or organic (O) meats from the human food supply chain as well as Marine Sustainable (MSC) sources for all of our fish-based products.